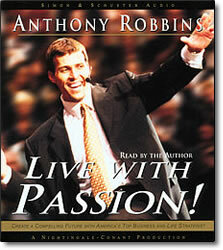 Live With Passion – CDs by Anthony Robbins – Discount! Anthony Robbins’ revolutionary new program LIVE WITH PASSION will help you secure the life you’ve always wanted; the life you’ve watched others attain, but were too scared and disillusioned to seek for yourself. Let’s face it, you want certain things out of life–financial rewards, personal fulfillment, and satisfying relationships. And now, with Anthony Robbins’ groundbreaking program LIVE WITH PASSION, you can master your behavior, your emotions, your finances, your business, and your career. Infuse your life with meaning and purpose.